Archives of Eaton Bray News for July 2012. This article was published in July 2012. Please see Latest News for more recent information. ... it's that time of year when we think about the January pantomime. The theme is still a mystery but we're told that famous sleuth, Sherlock Holmes, will be playing his part to solve it! If you'd like to play your part, auditions will take place locally on Sunday, 9th September at 2.00 p.m. and Monday, 10th September at 7.30 p.m. Please contact Bekka via the website for more information. And if you don't want to act, you can still play your part and join in the fun. Help is always needed behind the scenes – design, carpentry, painting, sewing, admin, etc - as much or as little as you can commit. Call 01525 221583 to find out more. 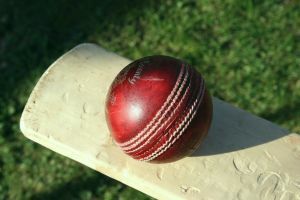 Cricket: Bray win in the sunshine!!! In the first weekend of sunshine since 1924, the Bray Sunday XI beat Great Gaddesden by 95 runs. Pale chests were out in force, as the temperature soared to a sauna-like 24 degrees! With factor 20 Ambre Solaire in hand, skipper Peacock J started proceedings by losing the toss. GG stuck the Bray into bat on a slowly drying wicket and were immediately reaping the rewards after Alden was out in the first over, bowled round his legs for a belligerent 0. 'Polly' Parrott and Josh negotiated opening bowlers Upton and Vinod, and then accelerated, racking up a partnership of 126 with Polly making his maiden half-century for the club before being bowled by Hearn for 53, who accounted for Tickell a ball later. Holbrook joined his skip at the crease and with both players forcing the pace, a 49-run partnership ensued. With Holbrook falling for 11 and Peacock snr departing soon after, slogger Harv whacked a few more and the captain registered a century in the closing overs. However, the thought of topping up his tan and trying a shot he had never before played led him to the departure lounge for a well played 103. Davies the batsman joined the fun in hitting a boundary in the last over, in which Bray ended up totalling a challenging 202-6 from their 40 overs. After a swell tea from Mrs J and co and a bit of Bray blue sunblock, the team set out to defend their total with honour, blood, sweat and good banter. Opening with the 'Crafty Cockney' and 'The Artful Dodger' GG were immediately under the cosh as Hemming accounted for opening bat Plummer, courtesy of a brilliant stumping from Alden. Tickell then took charge, removing skipper Moore (caught / juggled behind) and Hearn (caught) in quick succession as GG slumped to 23-3. Spin duly became the order of the day, with the remaining 6 bowlers being of the slow-ish variety. Sharp fielding, excellent glovework from keeper Alden and brilliant spin bowling led to the demise of GG with wickets for Green (1-21), the evergreen Jones (2-3), Holbrook (1-17), Ryan (2-18) and Harvey (1-0) as the GG middle and lower order collapsed leaving them 95 runs short, finishing on 107! A great all-round performance from all 11 men culminating in this memorable victory! Karaoke banter and a jug from the skip followed, (you got lucky boys, they don't come out often) finishing off one fine weekend! In the second meeting of these two sides this season, Bray were heavily beaten at The Rye Gardens ground. Counting up recent fixtures against the local mountain men, it must be nearly 437 games since our Sunday XI last beat Studham. The next time someone knocks on your door and says they are from Anglian Water, we'd like you to take just a little of your time to double-check their identity before you let them in. Bogus callers may claim to be from Anglian Water or even from 'the water board' and they might look quite convincing too, but you can find out for sure with one quick free phonecall. Please take their card and close the door while you call us, any time of day or night, on 0800 145 145. You will be given a description of the person at your door and a unique number. If the caller can not give you the number then they are not a genuine Anglia Water Empoyee. Close the door and call the Police immediately. So there I was, peacably walking along Eaton Bray High Street collecting from the watching crowds. It happened that I was just behind the Revelation Majorettes when the heavens opened. 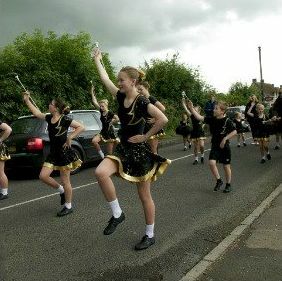 Now the majorettes comprised mums, teenage girls, youngsters, right down to girls as young, possibly, as 5 years old. Within moments we were all soaked and, for a few moments in the torrential rain, panic set in. There was no obvious shelter but bystanders rushed in from the sides with umbrellas for the littlest girls or tried to hurry them under trees. It only took a short time for a commanding adult voice to say 'Get them in the car' and soon a dozen or so dripping little girls were in shelter. The downpour poured down - some collecting buckets appeared to have over ½ inch of water in them so I guess we had about ½ inch of rain in about 20 minutes. But instead of feeling sorry for themselves the remaining troupe of majorettes set to with renewed vigour and carried on as if nothing was happening. And when I got to Edlesborough Green it was just the same. the downpour was over everyone was out enjoying themselves carrying on as normal. I thought to myself 'What an excellent image of what Community should be all about'. There are times when adversity comes upon us and for a while we really don't know what we should do or how we are going to cope. Our natural reaction is to care for the weakest, rather like a mother hen and just as the majorettes had done. And then we press on through the adversity and carry on, sometimes as normal, sometimes with renewed strength, just like the majorettes had done. St Mary's Village Carnival exemplified that image of Community on Saturday. For a while it was really grim but a magnificent team pulled through, took sensible decisions and ensured that our Community had a wonderful afternoon and, once again raised lots of money for the organisations in and around our villages. You are viewing the July 2012 archive.